CHIC is a project to create bridges between the fields of design, applied arts, digital, popular education and social and solidarity economy. The project aims to develop Open Source Design prototype around stamps / 3D object, prototyping of a digital press. The project brings together seven organizations in Europe (France, Italy, Spain, Belgium, and Latvia), around different areas (Design, free culture, fair economy, education, Digital …) to explore new design production skills and new economic conditions through collaborative and open approach through digital technologies. The event in Barcelona will include 2 days of workshops (closed doors) and a public session to present the work of the different partners. Establishment Public Territorial Plaine Commune is located north of Paris (France), it includes 9 cities and approximately 408 000 inhabitants. Identified as “Territory of culture and creation” within the metropolitan area of greater Paris. Culture and creativity are now the Red wire of the development of the territory, Plaine Commune is naturally part of the approach of the CHIC project. He assumes the role of leader in this project and is committed to co-host with the Minga association the European partnership. It will ensure the smooth running of the project and the compliance of the programme particularly in terms of communication and assessment and organize the transnational seminar of launch and return. His experience in economic modeling of third places will be necessary. The city of architecture and heritage architecture based in Paris (France) brings together a national museum, a school, and the French Institute of Architecture. It will help with the partners to develop the specifications of design workshops. It will organize a workshop at the Pointcarré fablab in Saint-Denis and will participate in workspaces for monitoring and data transfer, the creation of a web platform and will share the results with the general public. Particular attention will be on the quality of dissemination of the results to audiences little sensitized through the preparation of the seminar’s end, the link on the website of the city and a new approach to the non-public in the territories. The Minga association is an interprofessional federation located in Seine Saint-Denis (France) opening thoughts, discussions and actions where to weave bonds of interprofessional and civic solidarity around a common commitment: working together for a fair economy. It will contribute in collaboration with other partners in the overall management of the project and specifically to the design of the specifications, the implementation of activities by a role of Eve and co-coordinating with each partner in each country. It will ensure the Organization of events at the local level in connection with french partners, the drafting of content on economic development, the conduct of participatory assessment and contribute to the dissemination of the digital prototype. The openFab is an associative fablab located in Brussels (Belgium) that will develop the digital press reproducing graphic documents in different media (paper, textile, plexi…). It will ensure the operation on the technical, organizational, map the transmission of the methodology and the knowledge acquired on the European territory and beyond. The children’s Museum EXPLORA is a social cooperative located in Rome (Italy), which develops methods of active pedagogy sensitizing young people and their families in environmental, technological, supply issues… It will organize a workshop of buffers and a giant test with the public. Its team will contribute through its network of partners in education and design to produce a documentation practice and adapted to the general public for the prototype Design. The community of Liepaja ‘Department culture’ (Latvia) develops with the State, local government and other social partners, the extensive cooperation between the cultural sector and other sectors of the economy in order to create a cultural diversity and progress of cultural economy for sustainable growth. He founded in 2014 the Cluster of the cultural industry to solve problems of the cultural economy. It is an open platform for cooperation and exchange of knowledge of the entrepreneurs in the creation and individual professionals. 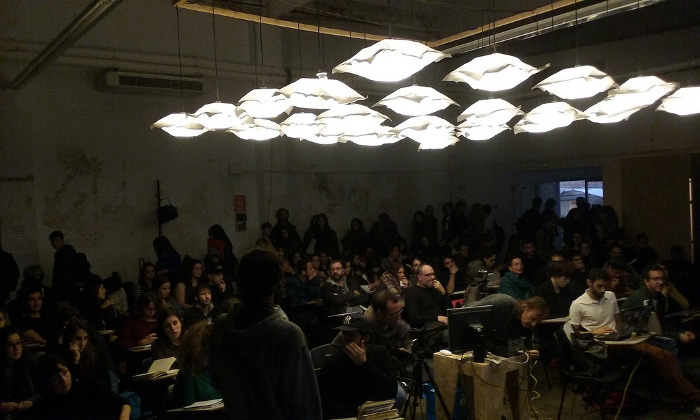 In practicing the diverse possibilities of the Design Open source (throught Making with numeric technologies, open production & diffusion), CHIC questions a process of a design creation that provides for the complexity of a common real life, in an european society in tension and mutation. The creation of stamps/traces is the support of this project, there where are working invention, cooperation, ethik of sharing in our multitudes, singularities, crafts in a time when the european history speeds up. The power of the social transformations generates an intensification of individual and collective precarious situations, moving from economic crisis to democratic crisis. Should we accommodate in between the weight of this reality and the temptation to take refuge in the entertainment and the gratuitous innovation without object, we experiment some ways of making design -peer to peer – that invents a sense of possible in a chaotic situation. Drived initialy by a muddled enthousiasm (like all process that does’nt cheat by cleverness), we suggest that the stamp doesn’t be watching like a reference tool from artisnal and décorative technicals from the local identities and european heritage. It’s also an object of certification delivered by an independant or state organisation. It vouches for conformity – of product, service, information of individual statute – with standards and current regulations, presents or desirables for future. The stamp is an object inherently ambivalent and it’s precisly this ambivalent dimension that must irigate all the work of the workshops. It’s by concrete productions that CHIC will become a lever to create cooperations with all kinds of people who wish to invest in the field of local democratic design at European level and to mobilize other on social issues . Bodypainting and tattoos are probably the first aesthetic action of human being. They gathered practical functions, like camouflage or protection with the needs of culture identification of different social groups, marking the different stages though live of a person or defining social roles and status of individuals within a group. The representation, modification, alteration of bodies is one of our first technologies and the traditional patterns used one of the first examples of design. Our bodies are in a way designed, as they are a social construct. We need our bodies to be alive but also for “being”. And their limits are not only restricted to the natural substance. Politics, ethics and technologies are as much as important as DNA chains to define them, to define us. In the digital or posthuman era, the relation with our bodies is even more fundamental in the creation of subjectivity, in the process of differentiation and identification with the others and in the definition of cultural identities. In a way, they are the battlegrounds of the “BioPower”. All the problems and big challenges we have as society can be crossed by this embodiment vision. From anorexia & bulimia to the right to expose or cover your body in public spaces and their representation in media, from to the right of expanding our physical limits with implants and limits of bioethics we are constantly dealing with our “wetware”. Gender is a technology and we are cyborgs in a war that is taken place around our physical boundaries. Can we design and print images, patterns or even design new skins for these bodies? How does affect and transform us physically things as patriarchy, colonialism, racism, intolerance, exclusion, difference or multiculturalism? What´s the role of design and designers in this scenario? The body and embodiment will be also very important for the methodologies used during the workshop. Our body is a way to experience reality. We can understand a concept, but the way an artisan works is asking his hands what to do. One of the most important thing about maker movement is not related with technology but also with recovering hand practises, dialog with materials and tacit knowledge. These are very important skills for today designers. The use of embodiment, of Making , by means of drawing, modelling or whatever act of making that implies skills constitutes the designerly way to reflect and research. As designers we deal with reality and complexity and we use our skills to transform the world they live in. But we are constantly asked to translate sensitivity using language and rationally structured thinking, so our our expressivity is constantly constrained. We tend to face reality it in a modernistic and Cartesian way by simplifying. The result is an engineering way of thinking that is not conected with reality. Complexity is better handled by trusting intuition, playing with the elements of resistance and accepting to float in ambiguity. Our culture does not provide the skills to do it this way but digital handcraft and the use of embodiment (known with your body) could do it. We will develop methodologies to achieve this way of research, combining high technology with pre-industrial methods trying to imagine how the XXII designers skills will be look like. In the workshop the participants will be working -in small groups and peer to peer relation – to to research through design on contemporary prototypes of body stamps, stamps of bodies, stamped bodies and everything in between and around. We will use 2D and 3D assisted technologies, hand tools and our hands as a tool, craftsman techniques, maker ethics and digital processes trying to find « what connects us to the world and others ». The use of our bodies, technology embodiment and cultural representations has the aim of empowering ethics, and cultural hibridation through design, using digital and nondigital technologies as materials. Concrete productions that CHIC workshops will become a lever to create cooperations with all kinds of people who wish to invest in the field of local democratic design at European level and to mobilize other on social issues . This workshop is oriented to: Designers, makers, builders, craftswomen, dancers, performers and IT people that want to shape societal transformation and are interested in transdisciplinary design conversations and works.